Este trabalho nasceu de uma hipótese frustrada: Você acha que faz sentido falar de uma arquitetura latino americana? Em caso positivo, quais seriam as características que tornam possível tal caracterização? This paper was born from a failed hypothesis: Do you think it makes sense to speak about a “Latin American” architecture? And if yes, what would be the characteristics that make such claim possible? Este trabajo nasció de una hipótesis frustrada: ¿Usted cree que hace sentido hablar de una arquitectura latino americana? ¿En caso positivo, cuales serian las características de hacen posible tal caracterización? LARA, Fernando Luiz. Imprecise Cartographies. Mapping contemporary architecture in the Americas. Arquitextos, São Paulo, year 13, n. 150.02, Vitruvius, nov. 2012 <http://www.vitruvius.com.br/revistas/read/arquitextos/13.150/4507>. This paper was born from a failed hypothesis. As part of my ongoing research with the LAMA (Latin American Modern Architecture) research group at the University of Texas at Austin a single question was asked to 20 prominent Latin American architects(1): Do you think it makes sense to speak about a “Latin American” architecture? And if yes, what would be the characteristics that make such claim possible? The answers were as diverse as are the regional variations in the vast space from California to Chile. The architects were equally divided between yes and no for an answer, for a variety of reasons. This paper departs from those interviews to debate the core of the idea of an American identity in architecture, arguing for a fluid and temporary cartography that could start mapping the complex set of relationships, influences and counter-influences. Processes of fragmentation and integration are partially responsible for the lack of consensus, as well as globalizing forces acting in the last decades that bring Latin American architects closer to each other but also closer to designers with similar sensibilities and interests halfway across the planet. Departing from the fact that 20 interviewees gave me 20 different answers, this paper is a provocative attempt on plotting those into a map, an open, fluid and imprecise map. Recalling Jorge Luis Borges’ story of the useless map on one-to-one scale this open cartography is by definition reductive and arbitrary. The purpose of such drawings is only to induce and provoke other drawings, a composite of partial layers that make more sense combined. The paper is after all a call for multiple other maps to be drawn and overlapped. For the maps that accompany this article the complex and often contradictory information yielded from the interviews were organized chronologically into four moments. The first one goes back 200 years to the dawn of independence in the American nations to look at different building traditions. The three other maps look at different moments in the 20thcentury: the arrival of modernism (1920-1940), the rise of regionalism (1950-1980) and the contemporary scene (after 1990). The choice of watercolors as drawing tool is not random. The wet paper allows us multiple overlaps and no precision. The maps are like sketches, tools for searching something else. It would be easy to start with a North-South American divide. Anglo versus latin; protestant versus catholic; rich versus poor: each one of those stereotypes are collapsing faster than we can grasp. The very idea of Latin America needs to be readdressed and re-accessed constantly. The issue already discussed by so many authors, from Octavio Paz(2) to Walter Mignolo(3) and from Marina Waisman(4) to Hugo Segawa(5)pertains the artificiality of the concept. Proposed by French intellectuals in the 19th century with the aim of solidifying Paris’ sphere of influence over parts of the new world, the idea of Latin America had an arbitrary and foreign point of departure. It is as if the center of gravity of this discussion was in Europe, not here. The main problem with the idea of Latin America is that too many contradictions appear when one tries to reduce it to simple definitions. Language is surely a major characteristic since the majority of the region speaks Spanish or Portuguese with a minority speaking French. However, French-speaking Quebec is not considered part of Latin America. Geography also does not help since the majority of Mexico sits in North America, a fact that many people tend to overlook when they think of such continent. Religious differences between a protestant north and a catholic south would be another important characteristic but that is also challenged by the growth of Pentecostalism in the south and the growth of Catholicism in the North. Even the 20th century division between a richer north and a poorer south is in route to becoming irrelevant with the US expected to become as unequal as Brazil in little more than a decade if the current trajectories continue. Nevertheless, after being widely used for two centuries the term gained traction and does serve to define a multiplicity of layers (language, geography, religion, economy) that overlap in the new world, south of parallel 30N, forming a picture that might be blurred but is always dense. Any attempt at precisely defining Latin America would fall short in light of those superimposed layers. Our main point of departure here is the fact that two different building cultures(6) do divide the new world into regions where frame structure dominates and regions where masonry is the rule. While the frame structure tradition comes primarily from northern Europe, in the Americas it prevails in the Anglo colonization of the north but also in the Caribbean costal areas where the bungalow was widely adapted. Further south, in the costal settlements of Chile and the Argentinean Patagonia wood construction was more efficient than masonry and the framing tradition also prevailed. Masonry, overwhelmingly predominant in Latin America, has a direct relationship with ancient Rome and its Mediterranean outposts. Interestingly enough, once we map those building cultures it is at the borderlands of such regions that the most interesting architecture occurs. Like sand and water fighting for space at the beach, masonry and framing are creating a hybrid building culture in a 500km band that runs along the Rio Grande. Mexican workers learn framing in the US and bring it home while their traditional masonry skills are increasingly being used north of the border(7). In Chile framing and masonry collapse in the works of Sebastian Irarrazabal and Cecilia Puga while Alberto Mozó and Pezo+Ellrichshausen push the envelopes on either side of the divide. As the cultural historian Homi Bhabha elegantly reminds us, our idea of community is formed by ways in which we continuously narrate our shared knowledge(8). At the dawn of the 20th century Latin American architecture was presented as an independent category first in Spain and in the United States which by is an interesting fact in itself. In the US Latin American architecture was being discussed as part of an effort to coin “Pan Americanism” under US leadership. The idea of Pan-America was already 100 years old by then, having appeared in the early 1800s when the liberators Simon Bolivar and San Martin attempted to create a union of newly independent Latin American nations at the same time that the US implemented the Monroe Doctrine (1823) pledging to keep the Americas free of colonialism which also meant under it own (exclusive) influence. In Spain the International Exhibition in Seville, 1929, introduced the idea of a Latin American identity to be expressed by the architecture of each pavilion. However, when scholars in Brazil, Argentina or Mexico discussed their architectural heritage they tended to do it in comparison with Europe, not cross-referencing each other. The center of gravity was still outside of the continent, floating somewhere in the North Atlantic. Antropofagia, Estridentismo, Martin Fierro were parallel avant-garde movements attempting to contextualize European ideas that never referenced each other much. This created a map in which each country is an island. Unlike the “jangadas de pedra” of José Saramago, the American archipelago seems to float to and from Europe. The old divide between frame structure versus masonry found its modern version with the separation between Bauhaus versus Corbusier influences. Nevertheless, it is important to understand that such divide was created quite artificially following local interests. Corbusier was unquestionably more important in Brazil and Argentina but Mies’ influence has always been there, still unacknowledged. Moreover, the canonical historiography of modernism in the Americas tends to start from a tabula rasa in the first decades of the 20th century when in fact there was never such void. Italian craftsman for instance had been the vectors of early modernizations, materializing all over the Americas a classic vocabulary systematized by the French academy. The story of modernism in the Americas must find its roots back into eclecticism and art deco to mention only two aesthetic synthesis that were extremely important from New York to Buenos Aires. After being celebrated in the 1950s as living proof of the infallibility of modernism, Latin American architecture would endure two decades of ostracism. Max Bill inaugurated the trend when he harshly criticized Brazilian architecture in 1953(9), followed by a series of derogatory reports on Brasilia in the early 1960s(10). As reminded by Jorge Francisco Liernur, “force of naturalness, impulse of youth and mystery of the myth” became respectively “childish impulses, anarchy of the jungle and overloaded sensuality”(11). The centers of architectural media in the 1960s (which coincide squarely with the newly formed North Atlantic Treaty Organization) were by now focused on their own achievements post World War II and left little if any space for peripheral manifestations. The rise of military dictatorships in the majority Latin American countries as a direct result of the Cold War contributed to even wider gap between local conversations (often pushed underground) and new architectural currents. Still referencing European and North American issues, Latin American architecture seemed out of tune regarding the nascent post-modernism of NATO, what turned out to be a blessing after all. Meanwhile, remarkable experiments such as PREVI in Lima, the Banco de Londres in Buenos Airtes or the Portales neighborhood in Santiago were made oblivious by a mainstream media infatuated with post-modernism. The third map looks at the regional schools that flourished between 1950s and 1980s in the Americas. Ignored by the architectural media at large and incorrectly identified with modernism or post-modernism, those movements were in fact local responses to the exhaustion of high modernism. While in Austin the Texas Rangers were challenging the Bauhaus education, in Recife Amorim and Borsoi were adapting the carioca modernism to an equatorial climate. In Colombia, Salmona - the rebel disciple - was adopting the brick aesthetic of Fernando Martinez and creating a powerful local identity that survives to this day. The same was happening in São Paulo with Vilanova Artigas and Paulo Mendes da Rocha. At the Jardines del Pedregal Barragan touched a nerve of mexicaness (a bit nostalgic nonetheless) that would also become iconic in an inverted manner: first abroad and only later at home. Those regionally-based architectural movements would turn into the seeds of the real integration of (Latin first) American architecture. While the 1980s were said to be the “lost decade” for Latin American economies, the reality is that many countries returned to democratic rule and in parallel the architectural debates were re-born and invigorated. The center of gravity was coming home for the first time. The dawn of the Seminarios de Arquitectura Latinoamericana is intertwined with the celebration of regionalism. The first SAL was organized almost informally during the first Buenos Aires Biennal of Architecture in 1985(12). Marina Waisman from Argentina is credited with the initiative, supported by the magazine Summa, the University of Buenos Aires and the CAYC. The simple fact that Severiano Porto and Joaquim Guedes from Brazil, Rogelio Salmona from Colombia and Enrique Browne from Chile were around the same table debating with scholars Silvia Arango (Co), Ruth Verde Zein (Br), Ramon Gutierrez (Ar) and William Niño (Ve) was absolutely unprecedented. Writing years later Marina Waisman remembers that moment as a foundational act in which Latin American architects, usually well versed in European or North American peers, realized with gusto that their neighbors also had amazing ideas(13). Reflecting on the center-periphery relationship, Waisman points out that it would be presumptuous (and quite impossible) to aspire to be the center of the world, but very much necessary to become the center of ourselves. Frampton’s Critical Regionalism was thus intensely discussed in Latin America and those generated two main responses, from Argentinean Marina Waisman and Chilean Cristian Fernandez Cox. Criticizing the frivolous post-modernism of Michael Graves and Hans Hollein and the theoretical thinness of “deconstructivism”, Waisman named the 1980s the “decada rosa” or pink decade. All aspirations of slightly transforming the world for the better were gone in those times of Reagan and Thatcher, except in Latin America where inequalities were still rampant. But instead of an architecture of resistance as proposed by Frampton Waisman called for an architecture of divergence. The subtle difference implied that Latin American architects could consciously choose which elements to adopt and which elements to resist, diverging from North Atlantic trends instead of opposing it. Chilean scholar Cristian Fernandez Cox also responded to those debates in a series of articles in which he articulated the idea of modernidad apropiada. In it Fernandez Cox plays with the double meaning of “apropiada” in Spanish, meaning both the appropriated modernity and the proper (correct) modernity. Denouncing centuries of an exocentric obsession (lowing always abroad), Fernandez Cox calls for an endocentric attitude, a fresh look that would reveal submerged identities and new categorizations. Those identities, now rescued, would work as digestor crítico to cannibalize foreign influences. In parallel to those intellectual proposals were the works of Éolo Maia, Severiano Porto, Juvenal Baracco, Rafael Iglesia, Enrique Browne and so many others. As diverse as their architecture were, for the first time those architects followed each other’s work and knew each other personally, a striking difference from the previous generation. In the 1990s two different movements transformed the historiography (and indeed the practice) of architecture in Latin America. An overall turn towards valuing our modernist heritage was complemented by growing integration. Colombian architects are teaching in Brazil, Brazilians are winning competitions in Chile, Chileans are building social housing in Mexico, Mexicans are winning prizes in Ecuador, and so on and so forth. An unprecedented scale of integration now exists in Latin America and we expect it to grow even more in the near future. The economic integration of Mercosur prompted a renewed interest in neighboring countries while at the same time facilitating contact. Travel between São Paulo and Buenos Aires for instance increased from 6 flights per day in 1990 to over 30 per day in 2011. A series of meetings, either academic conferences or exhibitions (the biennales would be the best example) approximated Latin American architects as ever before. For the first time in history the very best architects of Brazil and Argentina were travelling to Quito and Bogotá and not only to New York and Paris. As a result of such meetings in addition to easy flow of graphic information over the internet the architects mentioned in this entry all know each other personally and follow each other’s practice online, on real time. Angelo Bucci, Giancarlo Mazzanti, Alejandro Aravena, and Gerardo Caballero teach abroad often and are invited to speak at several international events every year. Others are not so invested yet in an international career but travel no less often, showing their work in neighboring countries as well as in the US and Europe. Such integration (in person or virtual) happened in parallel to a crescent valorization of the region’s modernist heritage. After flirting with post-modernism in the 1980s the discourse of pluralism and regionalism mutated into a revaluation of the successes (and shortcomings) of modernism in each different country or region. The best architecture of the first decade of the 21st century (and here we are again taking a risk because it is too soon to use the term ‘best’ with the degree of certainty that we aspire) is acutely connected to the local building culture, respectfully appropriates local modernisms and is strategically linked to other architectures, close by or halfway across the planet, that supports its conceptual discourse. That works for Dellekamp, Bilbao, Canales and Kalach in Mexico; Mazzanti, Bonilla, Velez, Mesa and Paisajes Emergentes in Colombia; Saez, Moreno and Al Borde in Ecuador; Leon in Peru; Benitez and Corvaren in Paraguay; Mozo, Puga, Radic, Irrarazavel and Aravena in Chile; Iglesia, Caballero and Bertolino in Argentina; Gualano and Studio Paralelo in Uruguay; Bucci, Puntoni, MMBB, Oca, Andrade/Morettin, Baldarini, Estudio América, Arquitetos Associados, Teixeira, Juaçaba, Rua, Bernardes/Jacobsen and O Norte in Brazil and so many others that should be added to this arbitrary and by definition incomplete list. More than defining a movement or a common aesthetic they define a center of gravity, the holy grail of Amereida(16) that finally can be found coinciding with the geographic center of the region. 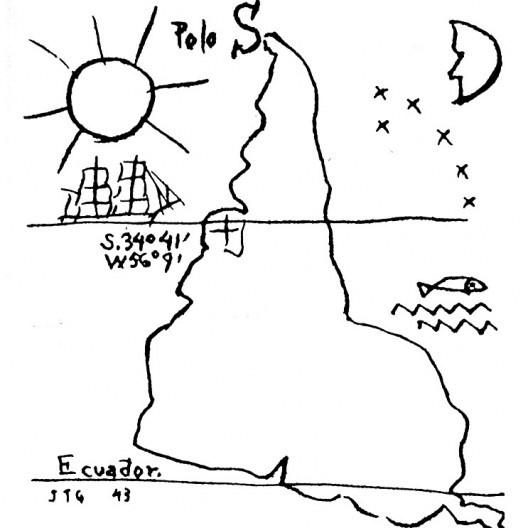 The maps will always be insufficient like the one described by Borges but we need them anyways. This article is the third of a series about Latin American modern architecture, written by group LAMA (Latin American Modern Architecture) from University of Texas at Austin, under the coordination of Prof. Fernando Luiz Lara. The interviewees were Angelo Bucci, Mauricio Pezo, Sofia von Elrichhausen, Enrique Larranaga, Tatiana Bilbao, Jose Maria Saez, Hugo Mondragon, Dereck Dellekamp, Carlos Teixeira, Renato Anelli, Adrian Moreno, Max Rhom, Lula Marcondes, Giancarlo Mazzanti, Monica Bertolino, Alberto Mozo, Jorge Liernur and Patricia Morgado, plus regular conversations with Luis Carranza and Felipe Hernandez. PAZ, Octavio. El laberinto de la soledad. Ciudad de Mexico, Cuadernos Americanos, 1950. MIGNOLO, Walter. La idea de America Latina. Madrid, Editorial Gedisa, 2007. WAISMAN, Marina. Primer Seminario de Arquitectura Latinoamericana: Un auspicioso comienzo. In Arquitectura latinoamericana – pensamiento y propuesta. Mexico DF, UAM Xochimilco, 1991. SEGAWA, Hugo. The essentials of Brazilian Modernism. Design Book Review, n. 32/33, 1994, p. 64-68. DAVID, Howard. The Culture of Building. New York, Oxford University Press, 1999. LOPEZ, Sarah. The Remittance House: Architecture of Migration in Rural Mexico. Buildings & Landscapes: Journal of the Vernacular Architecture Forum, Vol. 17, n. 2, Fall 2010, p. 33-52. BHABHA, Homi. Nation and Narration, London, Routledge, 1990. BILL, Max. Report on Brazil. Architectural Review, vol. 116, n. 694, August 1953, p. 238-239. MOHOLY-NAGY, Sybil. Brasilia-Majestic concept or autocratic monument? Progressive Architecture, n. 40, out. 1959, p. 88-89. ZEVI, Bruno. Inchiesta su Brasilia. L’Architettura – Cronache e Storia, n. 51, jan. 1960, p. 608-619. LIERNUR, Jorge Francisco. A New World for the New Spirit: Twentieth Century Architecture's Discovery of Latin America. Zodiac, n. 8, 1992-1993. Subsequent Seminarios de Arquitectura Latinoamericana were held in Buenos Aires - Argentina (85), Buenos Aires – Argentina (86), Manizales - Colombia (87), Tlaxcala – México (89), Santiago de Chile – Chile (91), Caracas – Venezuela (93), San Pablo – Brasil (95), Lima – Perú (99), en San Juan - Puerto Rico (2001), Montevideo – Uruguay (2003) y en Oaxtepec – México (2005) y en Concepción / Chiloé - Chile (2007), Panama City (2009) and Campinas – Brasil, (2011). WAISMAN, Marina. Op. cit., p. 8. FRAMPTON, Kenneth. Modern Architecture and Critical Regionalism. Transactions, n. 3, 1983, p. 15-25. EGGENER,Keith. Placing Resistance: A Critique of Critical Regionalism. Journal of Architectural Education 55, n. 4, May 2002, p. 230. Amereida is the name given by the Valparaiso group to the mythical journeys around South America in search of its landscape identity. Fernando Luiz Lara is professor at the University of Texas at Austin School of Architecture.